2 that the color of the wire will match the letter on the thermostat. 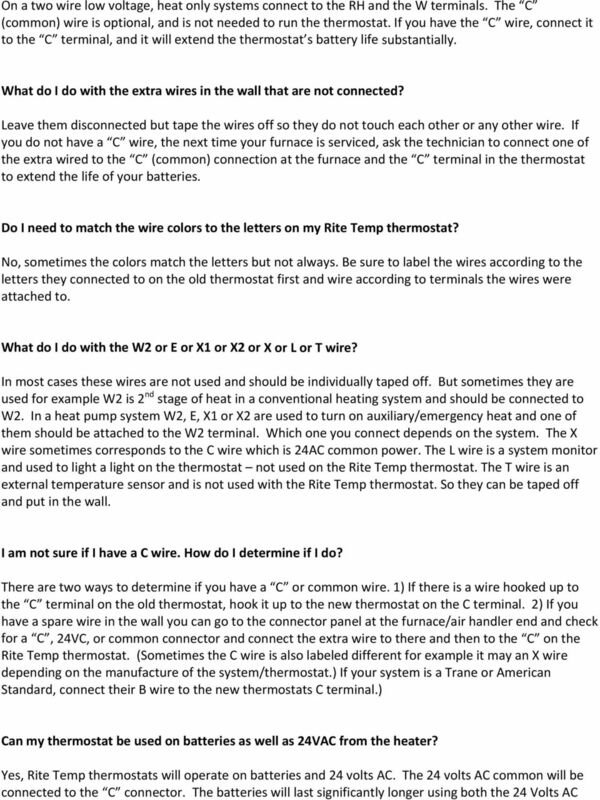 Once you determine which wires you have please referred to the wiring diagrams for the model Rite Temp you have. There is no color code; even if some of the wire colors seem to match the letters, do not use the wire color, use just match the letters to connect the wires. 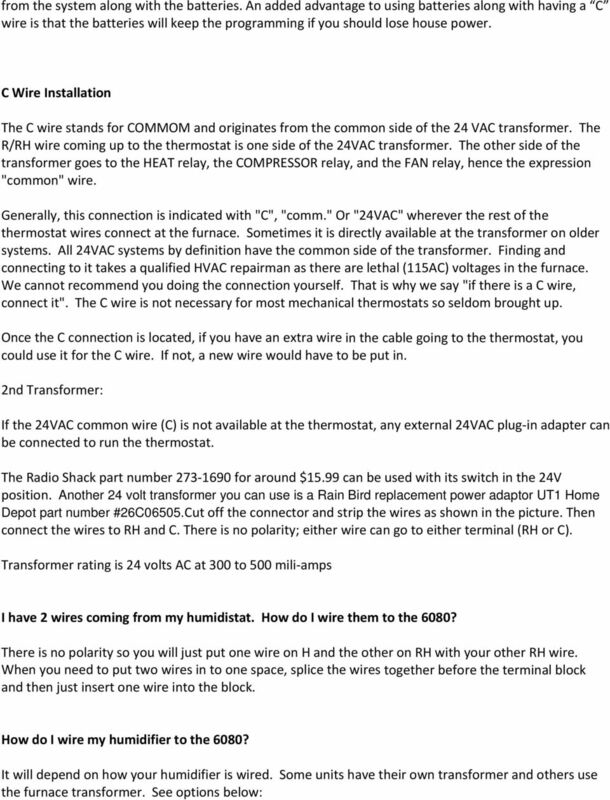 How should the wires be prepared for installation in the wire terminal block on the 6020 thru 6080 thermostats? To wire the thermostat strip the wires back about 1/8 of an inch. Insert the wire in the correct terminal making sure you go through both holes and then snug the screw down tight enough to get a good contact but not too tight that you break the wire or the screw. Then pull on the wire to make sure it is connected. I have 5 wires and 4 of them connect to the old thermostat. Where do I connect the other wire to? Only re connect the wires that were connected to the old thermostat. Do not connect any other wires as you do not know where or it they are connected to the heating and or cooling system. Do not connect the extra wire to the C or any other terminal. Where should I connect the C wire? If you have a C wire, connect it to the C terminal. Do not connect anything else to the C terminal. What do I do with the W2 and/or E and/or X2 wires? W2 or X2 wires are used on two stage gas or oil or electric heating systems or a heat pump with auxiliary heat. If there is an E wire tape it off as it is not necessary. Rite Temp has several units that are compatible with multistage heating and heat pump systems. See compatibility Matrix for compatible models. All or just some of these wires may be used with the new thermostat. 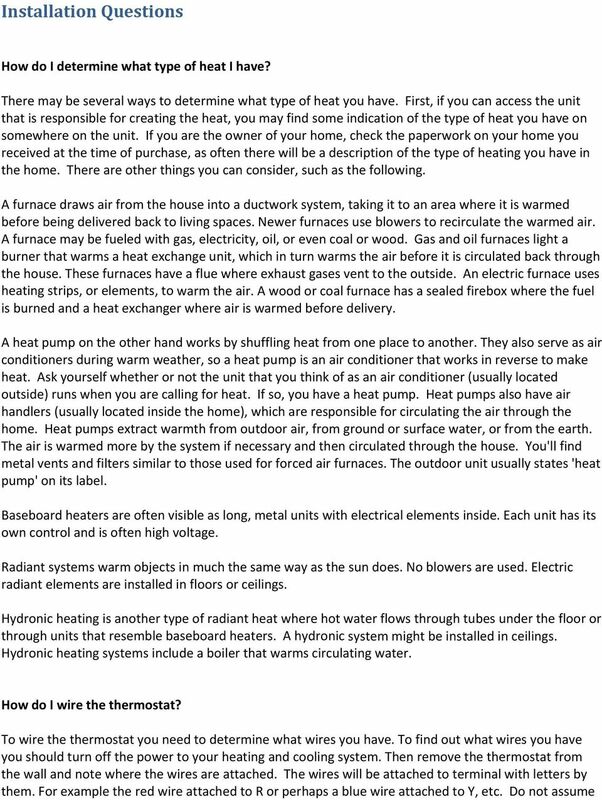 Please refer to the installation manual or contact support at or thermostats.com Where does the red wire go? If the red wire was connected to the R terminal on the old thermostat, then connect to the RH terminal on the new thermostat. If a different colored wire was connected to the R terminal on the old unit then label it and connect to the new thermostat in the same way. Always rerer to the letter to which the wire was connected on the old thermostat before removing the wire. This will be the label for your wire. There is no color code, just a letter code. 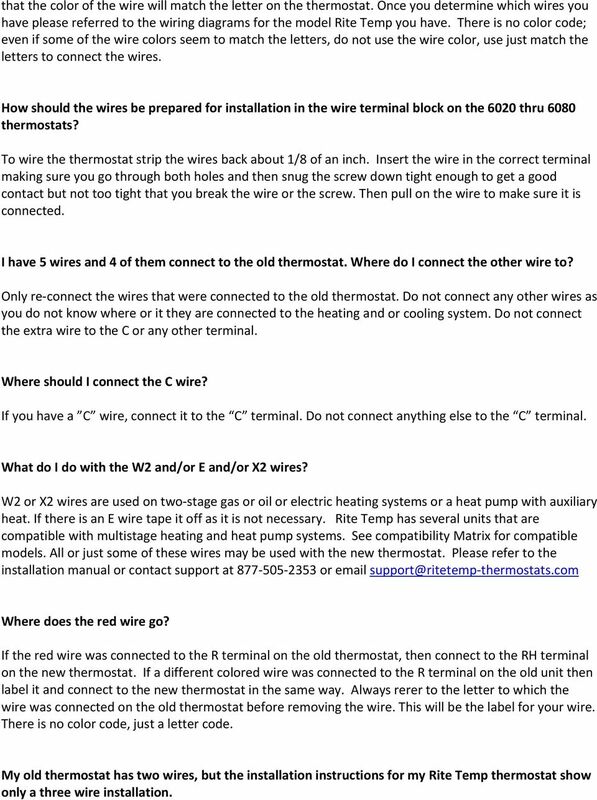 My old thermostat has two wires, but the installation instructions for my Rite Temp thermostat show only a three wire installation. 5 My old thermostat had an anticipator adjustment. Where is it on yours? Rite Temp thermostats do not require an anticipator adjustment because it is an electronic thermostat. Electronic thermostats typically use temperature sensing devices called thermistors which are very small, with almost no thermal mass. These devices track the air temperature very well so no anticipator is necessary. 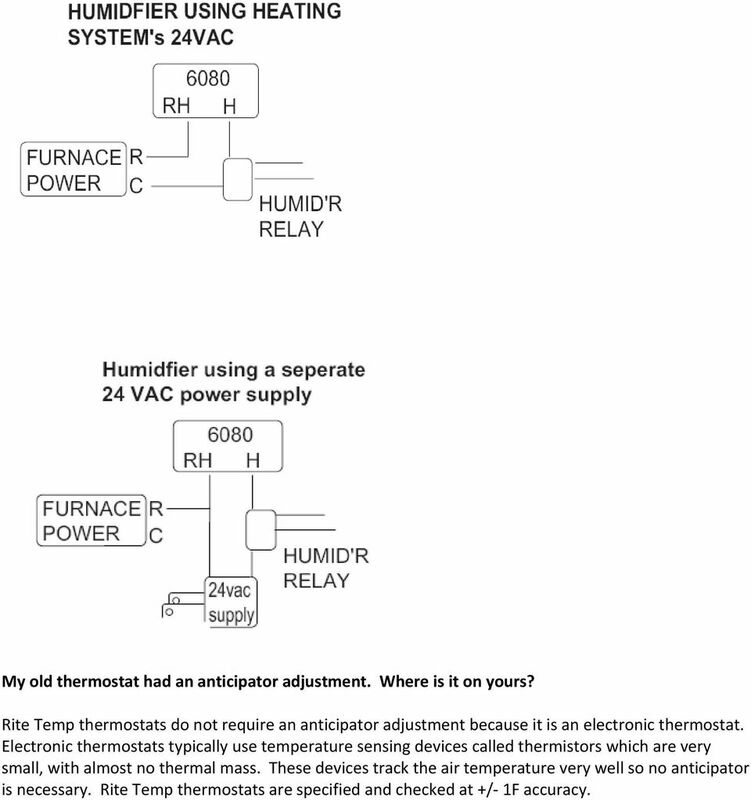 Rite Temp thermostats are specified and checked at +/ 1F accuracy. General Information. Do programmable thermostats really save energy?